Fined for practicing medicine without a license, 1873. On Saturday morning Judge Foster gave his ruling on the demurer interposed by the defendant in the Norrie-McGrew libel case. It was in favor of Norrie. Judge Hartwell immediately appealed to the Supreme Court. Later in the day A. P. Peterson, the attorney for the complainant, notified the court that the case would not be prosecuted so it has been dropped from the calendar. Hawaiian Gazette, Volume XXVIII, Number 23, Page 9. June 6, 1893. Keeaumoku ahuula destroyed in Peleioholani house fire, 1901. Liliuokalani Will Testify—Alleged That the Cloak Was Stolen From the King’s Palace. 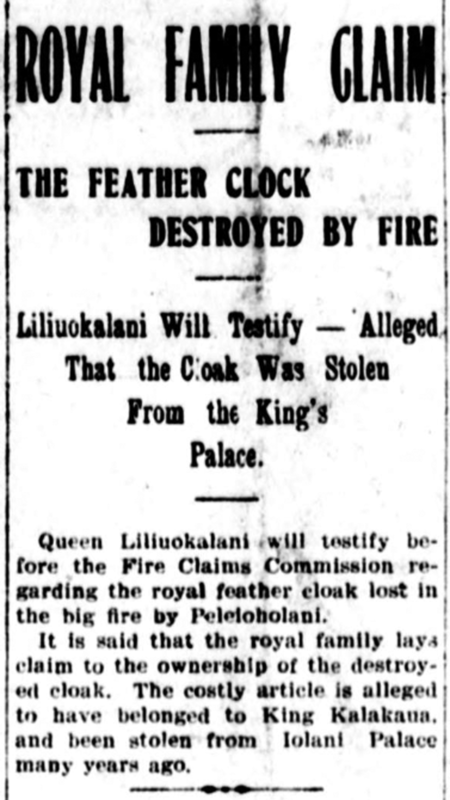 Queen Liliuokalani will testify before the Fire Claims Commission regarding the royal feather cloak lost in the big fire by Peleioholani. It is said that the royal family lays claim to the ownership of the destroyed cloak. The costly article is alleged to have belonged to King Kalakaua, and been stolen from Iolani Palace many years ago. Evening Bulletin, Volume XI, Number 1984, Page 1. November 2, 1901. Those arrested participating in the “Wilcox Rebellion,” 1889. THE REVOLUTIONISTS TO BE PUT BEFORE A JURY. Treason—R. W. Wilcox, A. Loomens, Alex. Smith, H. P. Kauaeahu (Malulani), H. Kaaha, B. H. Kahananui, A. S. Mahaulu, J. M. Poepoe. Total 8. Conspiracy—T. P. Spencer, S. E. Kaiue, D. W. Kahuakai, Sam Hook, Hamaia, Kaona, Kukaulalii, A. K. Palekaluhi, E. H. Mahuka, S. K. Pua, George Kaili, Kailianu, Kanikalio, Kalili, Pamalo, Manuel Kaaua, J. Kuamoo, Kauhikoa, Kahoomahele, Ho Fon, James Kauhane. Total 21. Rioting—L. Kaimmoku, Kaalokai, J. W. H. Wahineaua, Sam Leleo, George Maxwell, Adam Kaeo, John Kaai, Kahukula, R. Palau, Nahinalau, William Ferry, Pupule, Naihe, Hoomanawanui, S. Kila, Auwae, Kawehena, Solomon Kahalehili, Nakai, Keoni Palau, John Kelii, Kuaumoana, Kamaikaaloa, Kamehana, Manu, M. Makaluhi, Palikapu, Keawe, Makolo, James Kamakee, Kamaka, Loheole, Keoni Hapa, George Baker. Total 34. These are those left who were not arraigned before the Police Court, J. E. Bush, George Markham, R. N. Boyd, Kamai, Walu, Gaberiela, and J. Kanoa. Ko Hawaii Pae Aina, Buke XII, Helu 34, Aoao 3. Augate 24, 1889.